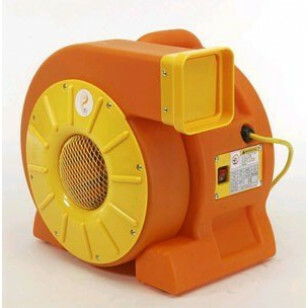 The AirFoxx inflatable blower fan has a powerful 1 HP high efficiency motor to ensure low amp draw. It is built with state of the art, leightweight materials that guarantee durability and long life. The handle is designed for easy carrying and the wide base provides stability. This model is great for blowing any standard size kids' bouncy pen. It even has enough power to make medium sized bouncers spring up. We do have other inflatable blowers available for you to purchase. They include a 1.5 HP blow up fan for inflatables, an inflatable advertising air blower, and a more economical children's bounce house blower. 1 horsepower blower quickly inflates large items for continuous use. Wide base provides stability for use indoors or outdoors. Recessed on/off switch & easy to carry handle make it easy to use for any operator. This is a review for the Inflatable Blower Fan.